Yuhu Group Australia’s much-anticipated Jewel development, the first absolute beachfront resort development on the Gold Coast in more than 30 years, has topped out with its central tower reaching 47 storeys and a maximum height of 170 metres - set to open mid next year. Jimmy Huang in front of Jewel towers promoting the Jewel International Kite Festival to be held on 30 September. (L-R) Gold Coast Mayor Tom Tate, Chairman of Yuhu Group Australia Xiangmo Huang, Queensland’s Minister for Innovation and Tourism Industry Development Kate Jones and Yuhu Group Australia Director and Chairman of associate company AWH Investment Group Jimmy Huang. Artist Impression - Yuhu's Jewel Gold Coast luxury hotel and apartment development tops out. Yuhu Group Australia’s much-anticipated Jewel development has reached a significant construction milestone with a community celebration to mark the topping out of the tallest of the project’s three stunning crystalline towers. The Jewel’s central tower now stands at its imposing maximum height of 47 storeys or 170 metres and is flanked by towers one and three which are also at their maximum heights of 41 and 34 storeys respectively. Following the commencement of construction in February 2016 – by major project partner Multiplex – the dazzling Jewel towers have rapidly emerged as iconic landmarks of the Gold Coast skyline thanks to their visionary design elements and beautiful aesthetics. The towers, with their distinctive glass curtain walling system, are the result of a creative partnership between renowned Florida-based architect Chad Oppenheim and award-winning DBI Chairman and Director of Design Barry Lee. The fundamental design concept drew inspiration from three smoky quartz crystals that were discovered in the region. 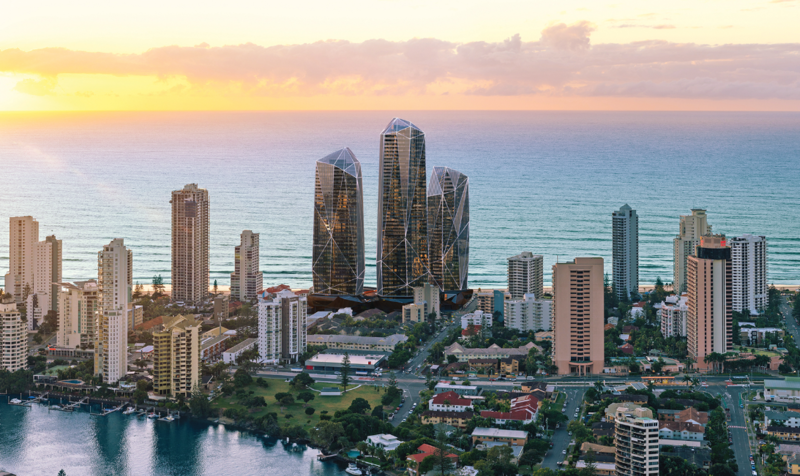 Significantly, the Jewel project, with its luxury international five-star hotel, represents the first absolute beachfront resort development on the Gold Coast in more than 30 years. It will be a major new asset to support the local tourism industry which is so vital to Queensland. The topping out ceremony featured the lifting of a majestic four-metre pandanus palm tree – a most familiar feature along Queensland’s famous beaches – to the rooftop with a giant sign reading: ‘Jewel touches the sky’, as a backdrop. A rooftop plaque was also unveiled to mark the special occasion. Queensland Minister for Innovation and Tourism Industry Development and for the Commonwealth Games Kate Jones and Gold Coast Mayor Tom Tate were among the official guests. Cr Tate was also to be joined by Chairman of Destination Gold Coast Paul Donovan to announce plans for a Jewel International Kite Festival on the beachfront in September. 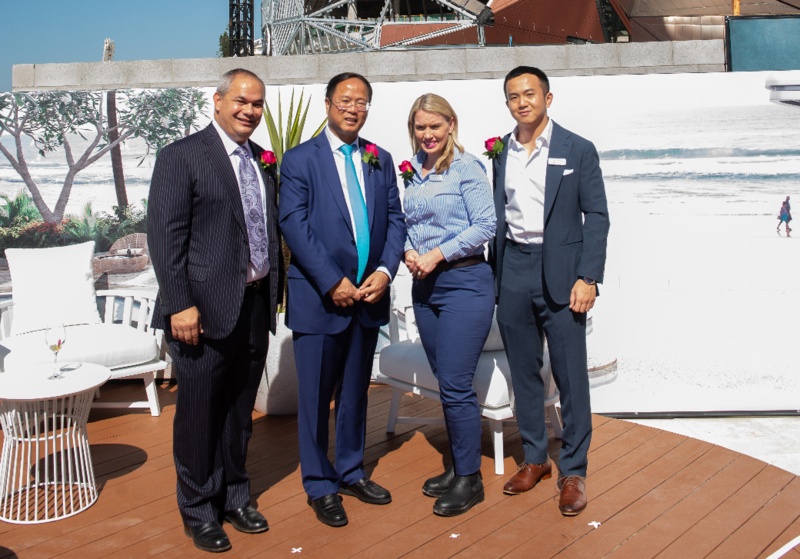 Yuhu Group Australia Director and Chairman of associate company AWH Investment Group Jimmy Huang said the topping out ceremony marked a very special moment for everybody who had been involved in the project journey to date. “The Jewel is something we can all be proud of as it will bring substantial community benefit to the Gold Coast for many decades to come. The team at Multiplex in particular, are to be commended for what they are delivering as part of this massive construction undertaking,” he said. “The Jewel will be an enviable home to many and, also a peaceful sanctuary for residents, hotel guests and visitors alike. It will be a truly world-class asset that will help underpin the broader economic contribution we want to make to the Gold Coast in terms of supporting tourism, employment and the like,” Mr Huang said. Multiplex Regional Managing Director Graham Cottam said the topping out of the Jewel towers was certainly a proud moment for Multiplex. “This is a hugely significant milestone for us and the result of a great deal of passion and hard work from the team,” he said. DBI’s Barry Lee said the Jewel’s crystalline design seeks to celebrate the underlying volcanic geology of the Gold Coast. “Our city is built on the remnants of the Mount Warning Shield Volcano and the geology revealed at our headlands underlies our entire coastline. Allegorically, the Jewel brings the crystalline substructure of the city to the surface in the hope people will question ‘what is this about?’ and perhaps come to a deeper understanding of our city and region,” he said. The luxury hotel development will be the centrepiece of tower two and feature a superb beach-facing resort pool as well as an expansive health and wellness centre, with a separate indoor pool, gymnasium and hair and beauty salons. The complex will also boast a grand ballroom for up to 800 people to cater for major events. The three Jewel towers will incorporate a wide selection of exclusive one, two, three and four-bedroom private residences, serviced by outstanding residential amenities, such as a 24-hour concierge service in tower three. Many of the residences offer spectacular ocean front and hinterland views. Residents, hotel guests and visitors will be able to enjoy a range of fine dining experiences, expansive bars and high-end retail shopping spaces all within metres of the renowned Surfers Paradise beachfront. The Jewel is now undergoing an extensive internal fit-out stage and remains targeted for completion by mid-2019.